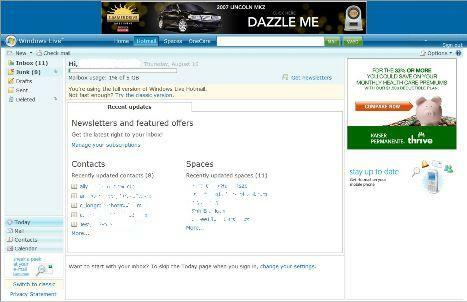 When user logins to Windows Live Hotmail (previously known as MSN Hotmail or more commonly been identified with simply Hotmail) via http://www.hotmail.com, the first page that the user sees will be Today page, where various news items, recent updates of contacts and spaces, plus newsletter subscriptions and featured offers together with ads and occasional reminders about features of Hotmail are displayed. Today page which always displays first is pretty much useless, and it will save you some time to bypass and skip the Today page and go straight direct to mail Inbox instead. On Today page, look for a line description read “Want to start with your inbox? To skip the Today page when you sign in, change your settings.” If you can find this line, click on “change your settings” link. Else if the link cannot be found, or you’re not on Today page, then click on Options on the top right corner, and select “More Options” from the drop down menu, usually located at the bottom of the menu. Then in the Options page, click on “Today page settings” under “Customize your mail” section. In the Today page settings page, choose whether you’d like to see the Today page after you sign in. If you prefer to bypass Today page and not showing or displaying it, select “Skip the Today page and take me straight to my inbox” radio button. Else, select “Show me the Today page after I sign in” radio button to revert the change to default to view Today page upon login. Click on Save button when done.